This guide shows you how to install OpenDJ directory services. The OpenDJ project offers open source LDAP directory services in Java. This guide shows you how to install, upgrade, and remove OpenDJ software. Unless you are planning a throwaway evaluation or test installation, read the Release Notes before you get started. If you only want to try OpenDJ server software, and you do not plan to store any real or important data that you want to keep, then you need not read this entire guide. Instead read Procedure 1.1, "To Prepare For Installation" and Procedure 1.2, "To Install OpenDJ Directory Server With the GUI". This guide is written for anyone installing OpenDJ who plans to maintain directory services for client applications. Basic OpenDJ installation can be simple and straightforward, particularly if you are already acquainted with directory services. Upgrading a running directory service without a single point of failure that can cause downtime requires at least a little thought and planning. If you are doing a basic installation, you might find yourself wanting more information about the process. This guide covers the install, upgrade, and removal (uninstall) procedures that you theoretically perform only once per version. This guide aims to provide you with an understand of what happens when you perform the steps. You do not need to be an LDAP wizard to learn something from this guide, though knowing how to manage directory services helps. You do need to know how to manage servers and services on your operating system of choice. You can nevertheless get started with this guide, and then learn more as you go along. Most examples in the documentation are created in GNU/Linux or Mac OS X operating environments. If distinctions are necessary between operating environments, examples are labeled with the operating environment name in parentheses. To avoid repetition file system directory names are often given only in UNIX format as in /path/to/server, even if the text applies to C:\path\to\server as well. Absolute path names usually begin with the placeholder /path/to/. This path might translate to /opt/, C:\Program Files\, or somewhere else on your system. Command output is sometimes formatted for narrower, more readable output even though formatting parameters are not shown in the command. The ForgeRock Knowledge Base offers a large and increasing number of up-to-date, practical articles that help you deploy and manage ForgeRock software. While many articles are visible to community members, ForgeRock customers have access to much more, including advanced information for customers using ForgeRock software in a mission-critical capacity. ForgeRock product documentation, such as this document, aims to be technically accurate and complete with respect to the software documented. It is visible to everyone and covers all product features and examples of how to use them. The ForgeRock.org site has links to source code for ForgeRock open source software, as well as links to the ForgeRock forums and technical blogs. If you are a ForgeRock customer, raise a support ticket instead of using the forums. ForgeRock support professionals will get in touch to help you. Procedure 1.1, "To Prepare For Installation"
Procedure 1.2, "To Install OpenDJ Directory Server With the GUI"
Procedure 1.3, "To Start OpenDJ Control Panel"
Procedure 1.4, "To Separate OpenDJ Directory Server Tools From Data"
Procedure 1.5, "To Install OpenDJ Directory Server From the Command-Line"
Procedure 1.6, "To Install From the Debian Package"
Procedure 1.7, "To Install From the RPM Package"
Procedure 1.8, "To Install OpenDJ Directory Server With a Properties File"
Procedure 1.9, "To Install OpenDJ REST to LDAP Gateway"
Procedure 1.10, "To Install OpenDJ DSML gateway"
Make sure you have a required Java environment installed as described in Section 2.1, "Java Environment" in the Release Notes. If your default Java environment is not appropriate, set OPENDJ_JAVA_HOME to the path to the correct Java environment, or set OPENDJ_JAVA_BIN to the absolute path of the java command. The OPENDJ_JAVA_BIN environment variable is useful if you have both 32-bit and 64-bit versions of the Java environment installed, and want to make sure you use the 64-bit version. Prevent antivirus and intrusion detection systems from interfering with OpenDJ directory server. Antivirus and intrusion detection systems that do a deep inspection of database files are not compatible with OpenDJ directory server. Disable antivirus and intrusion detection systems, or at least prevent them from operating on OpenDJ directory server files. Download enterprise software releases through the ForgeRock BackStage site. ForgeRock enterprise releases are thoroughly validated builds for ForgeRock customers who run OpenDJ in production deployments, and for those who want to try or test with release builds. Cross-platform OpenDJ directory server installation files. OpenDJ directory server native package for Debian and related Linux distributions. OpenDJ directory server native package for Red Hat and related Linux distributions. The OEM distribution of OpenDJ directory server does not include Berkeley DB Java Edition, and so does not support JE backends. 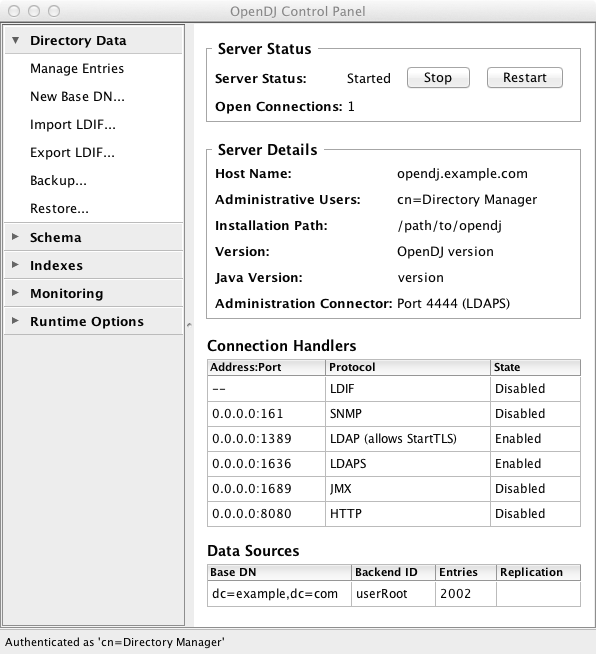 If you plan to install OpenDJ DSML gateway or OpenDJ REST to LDAP gateway, make sure you have an appropriate application server installed. For a list of supported application servers, see Section 2.4, "Application Servers" in the Release Notes. If you plan to configure SSL or TLS to secure network communications between the server and client applications, get a properly signed digital certificate that your client applications recognize, such as one that fits with your organization's PKI or one provided by a recognized certificate authority. To use the certificate during installation, the certificate must be located in a keystore provided with Java (JKS, JCEKS, PKCS#12), or on a PKCS#11 token. To import a signed certificate into a keystore, use the Java keytool command. For details see Section 5.2, "Preparing For Secure Communications" in the Administration Guide. The OpenDJ setup command launches a wizard that lets you install OpenDJ directory server through a GUI. If your environment picks up an old installation of Java, installation can fail. You might see an application error due to an old Java version. Unzip OpenDJ-3.0.0.zip, and then run the setup command, described in setup(1) in the Reference. When you unzip OpenDJ-3.0.0.zip, a top-level opendj directory is created in the directory where you unzipped the file. On Windows systems if you unzip OpenDJ-3.0.0.zip, with Right-Click > Extract All, be sure to remove the trailing OpenDJ-3.0.0 directory from the folder you specify. Welcome: summarizes the setup process and indicates the minimum required Java version. License: presents the license agreement to accept before installing OpenDJ software. Server Settings: prompts for basic server settings including installation path, host name, port numbers, secure connections, and credentials for the directory superuser (default bind DN: cn=Directory Manager). Topology Options: prompts for data replication options including whether this server is part of a replication topology, and if so, the port number and security settings for this server, as well as the connection settings for a remote replica, if available. Directory Data: allows you to import or to generate LDAP directory data as part of the setup process. This screen also allows you to select the backend type for data storage. Runtime Options: allows you to adjust JVM settings as part of the setup process, for example, to allow OpenDJ to use more memory if necessary. Review: presents current selections so that you can check everything is correct before running setup, with the option to start OpenDJ directory server after setup completes. Finished: summarizes how setup completed, with the option to launch the OpenDJ control panel. Figure 1.1, "OpenDJ Control Panel" shows the top-level window with status information. OpenDJ control panel manages directory data, LDAP schema, indexes, monitoring, and JVM runtime options through a GUI. To launch OpenDJ control panel, run the control-panel command, described in control-panel(1) in the Reference. The OpenDJ directory server setup command starts with OpenDJ tools and libraries distributed with the software, and generates the configuration files, log files, and data files required to run the server and to hold directory data. By default, all the files are co-located. Optionally, you can choose to put the data files in a different location from the tools and server libraries. After OpenDJ server tools and libraries are installed, but before the setup command is run, an instance.loc file can be used to set a different location for the configuration, logs, and data files. You cannot use a single set of server tools for multiple servers. Tools for starting and stopping the server process, for example, work with a single configured server. They do not have a mechanism to specify an alternate server location. If you want to set up another server after running the setup command, install another set of tools and libraries. Before running the setup command, create an instance.loc file to identify the location. The setup command tries to read instance.loc in the same directory as the setup command, such as /path/to/opendj/. The instance.loc file contains a single line identifying either the absolute location, such as /path/to/server, or the location relative to the instance.loc file. Run the setup command to complete OpenDJ directory server installation. The directories for the server configuration, logs, and data files are located in the directory identified in the instance.loc file. Unzip OpenDJ-3.0.0.zip in the file system directory where you want to install the server. The setup command, described in setup(1) in the Reference, uses the directory where you unzipped the files as the installation directory, and does not ask you where to install OpenDJ directory server. Therefore, if you want to install elsewhere on the file system, unzip the files in that location. Run the setup --cli command found in the /path/to/opendj directory. This command starts the setup program in interactive mode on the command-line, prompting you for each option. Alternatively, use additional setup options to specify values for the options you choose during interactive mode, thus scripting the installation process. See setup --help and the notes below. To perform a non-interactive, silent installation, provide all the options to configure OpenDJ, and then also use the -n or --no-prompt option. The setup command without the --cli option runs the GUI installer. TERMS, DO NOT DOWNLOAD OR INSTALL THE FORGEROCK SOFTWARE. Please read the License Agreement above. Directory Data:                Create New Base DN dc=example,dc=com. See /var/.../opendj-setup...log for a detailed log of this operation. Configuring Directory Server ..... Done. Importing LDIF file /path/to/Example.ldif ........... Done. Starting Directory Server ........... Done. The root user Distinguished Name (DN) identifies a user who can perform all operations allowed for the server, called root user due to the similarity to the UNIX root user. The default, cn=Directory Manager, is a well-known name. For additional protection, use a different name. The root user will use simple, password-based authentication. Later you can limit cleartext access to avoid snooping, but for now use a strong password here unless this is a throwaway server. OpenDJ uses fully qualified host name in self-signed certificates and for identification when you use replication. If you are installing a single server temporarily for evaluation, and are not concerned about replication and whether self-signed certificates can be trusted, then you can use an FQDN such as localhost.localdomain. Otherwise, use an FQDN that other hosts can resolve to reach your server. The default for LDAP is 389. If you are working as a user who cannot open port 389, setup suggests 1389 by default. This is the service port used to configure the server and to run tasks. You need a base DN, such as dc=example,dc=com, to add directory data. If you already have LDIF, the base DN you want is the DN suffix common to all entries in your LDIF. When you choose to create a base DN, the setup command also prompts you for a backend type, which identifies the implementation of the repository that holds your data. Later you can add more base DNs if your data belongs in more than one suffix. LDAP data interchange format (LDIF) is the standard text format for expressing LDAP data. If you have LDIF already, one reason you might not want to import the data right away is because your data uses attributes not defined in the default schema. Add schema definitions after installation, and then import from LDIF. If you have a large data set to import, also increase the import cache size, which you can do by passing a Java properties file. You might also prefer to perform data import offline. SSL requires its own, separate port for LDAPS traffic. The default port for LDAPS is 636. If you are working as a user who cannot open port 636, setup suggests 1636 by default. TLS lets you use StartTLS to negotiate a secure connection between a client and server, starting from the same server port you configured for LDAP. The digital certificate you need for SSL and TLS can be self-signed and created while you are working. Remember that client applications view self-signed certificates like fake IDs, and so do not trust them. Self-signed certificates for externally facing ports facilitate testing, but are not intended for production use. If you do not start the server during installation, you can use the /path/to/opendj/bin/start-ds command later. You can install OpenDJ in unattended and silent fashion, too. See the procedure, Procedure 1.8, "To Install OpenDJ Directory Server With a Properties File". Selecting previously unselected package opendj. The Debian package installs OpenDJ directory server in the /opt/opendj directory, generates service management scripts, adds documentation files under /usr/share/doc/opendj, and adds man pages under /opt/opendj/share/man. The files are owned by root by default, making it easier to have OpenDJ listen on ports 389 and 636. (Optional) Before you install OpenDJ, install a Java runtime environment if none is installed yet. The RPM package installs OpenDJ directory server in the /opt/opendj directory, generates service management scripts, and adds man pages under /opt/opendj/share/man. You can install OpenDJ directory server by using the setup command with a properties file. If you have multiple servers to install, consider scripting creation of the properties files. The properties file contains only installation options, and does not fully configure OpenDJ directory server. See /var/folders/.../opendj-setup-....log for a detailed log of this operation. Importing LDIF file /net/install/dj/Example.ldif ....... Done. Starting Directory Server ....... Done. At this point you can use OpenDJ directory server, or you can perform additional configuration. The OpenDJ REST to LDAP gateway functions as a web application in a web application container, running independently of OpenDJ. Alternatively, you can use the HTTP connection handler in OpenDJ directory server. For instructions see Procedure 5.7, "To Set Up REST Access to OpenDJ Directory Server" in the Administration Guide. Deploy opendj-rest2ldap-servlet-3.0.0-servlet.war according to the instructions for your application server. Edit opendj-rest2ldap-servlet.json where you deployed the gateway web application. The default JSON resource for the configuration includes both connection and authentication information, and also mappings. The mappings describe how the gateway translates between JSON and LDAP representations of directory data. The default mappings are built to work with generated example data and also the sample content in Example.ldif. For details on the configuration see Appendix A, "REST to LDAP Configuration" in the Reference. When connecting to directory servers over LDAPS or LDAP and StartTLS, you can configure the trust manager to use a file-based truststore for server certificates that the gateway should trust. This allows the gateway to validate server certificates signed, for example, by a Certificate Authority not recognized by the Java environment when setting up LDAPS or StartTLS connections. See Section 5.2, "Preparing For Secure Communications" in the Administration Guide for an example of how to use the Java keytool command to import a server certificate into a truststore file. Restart the REST to LDAP gateway or the application server to make sure the configuration changes are taken into account. Make sure that your directory server is running, and then check that the gateway is connecting correctly. If you generated example data, Babs Jensen's entry is not included. Instead, try a URL such as http://user.0:password@opendj.example.com:8080/rest2ldap/users/user.0. Deploy OpenDJ-3.0.0-DSML.war according to the instructions for your application server. Edit WEB-INF/web.xml to ensure the values for ldap.host and ldap.port are correct. Restart the web application container according to the instructions for your application server. This chapter covers upgrade from previous versions. If the OpenDJ directory server version is older than 2.4.5, you must upgrade first to at least OpenDJ 2.4.5 before following the procedures in this chapter. For details on upgrading to OpenDJ 2.4.5, see Upgrading OpenDJ Directory Server. With the migration of OpenDJ project code from Subversion to Git, the upgrade code has changed to no longer rely on Subversion revision numbers. As a result, upgrade from a nightly build is not guaranteed to work. Upgrade from one release to another works fine, as does upgrade from a release to a nightly build. As a workaround, rather than upgrading from a nightly build, install a new server alongside the existing server and use replication to bring the new server up to date before retiring the older server. Procedure 2.1, "Before You Upgrade"
Procedure 2.2, "To Upgrade to OpenDJ 3"
Example 2.1, "Upgrading to OpenDJ 3"
Procedure 2.3, "To Upgrade to OpenDJ OEM Edition"
Example 2.2, "Upgrading To OpenDJ OEM Edition"
Procedure 2.4, "To Upgrade Replicated Servers"
Procedure 2.5, "To Add a New Replica to an Existing Topology"
Procedure 2.6, "To Upgrade OpenDJ REST to LDAP Gateway"
Procedure 2.7, "To Upgrade OpenDJ DSML Gateway"
Prepare to perform the upgrade procedure as the user who owns the OpenDJ server files. Make sure you have the credentials to run commands as the user who owns the server. (Optional) If OpenDJ directory server runs with Java 6, move to a newer version before continuing the upgrade process. To move to a newer version, edit the default.java-home setting in the opendj/config/java.properties file, and then run the dsjavaproperties command. (Optional) If you are upgrading to OpenDJ OEM edition from OpenDJ 2.6, make sure there is enough disk space to export all of the data to LDIF files. After upgrade, you can enable OpenDJ as a Windows service again. Make sure you perform a full backup of your current OpenDJ installation to revert if the upgrade fails. Due to changes to the backup archive format, make sure you stop OpenDJ directory server and back up the file system directory where the current OpenDJ directory server is installed rather than creating a backup archive with the backup command. If you are upgrading to the OEM edition from OpenDJ 2.6, then this procedure does not apply. Skip instead to Procedure 2.3, "To Upgrade to OpenDJ OEM Edition". Before starting this procedure, follow the steps in Procedure 2.1, "Before You Upgrade". To upgrade to OpenDJ directory server installed from native packages (.deb, .rpm), use the command-line package management tools provided by the system. OpenDJ directory server backend storage options have changed since OpenDJ 2.6. The underlying implementation is based on an extensible architecture, allowing you to choose the backend storage type when you create a persistent backend for directory data. This procedure applies when you upgrade from OpenDJ 2.6, retaining the same underlying backend storage. The configuration changes from a Local DB backend to a JE Backend, and the upgrade procedure migrates the underlying backend database. There is no need to export data to LDIF when following this procedure. Log in as the user who owns the current OpenDJ server. Stop the current OpenDJ server. (Optional) If you have not already backed up the current OpenDJ server, make a back up copy of the directory where OpenDJ is installed. Unpack the new files from the .zip delivery over the current server files. Run the upgrade command, described in upgrade(1) in the Reference, to bring OpenDJ configuration and application data up to date with the new binary and script files that you copied over the current server files. By default, the upgrade command requests confirmation before making important configuration changes. For some potentially long-duration tasks, such as rebuilding indexes, the default choice is to defer the tasks until after upgrade. Tasks that are not performed during upgrade must generally be performed after upgrade but before you restart the server. You can use the --no-prompt option to run the command non-interactively, with the --acceptLicense option to accept the license terms non-interactively. When using the --no-prompt option, if the upgrade command cannot complete because it requires confirmation for a potentially very long or critical task, then it exits with an error and a message about how to finish making the changes. You can add the --force option to force a non-interactive upgrade to continue in this case, also performing long running and critical tasks. Start the upgraded OpenDJ server. At this point the upgrade process is complete. See the resulting upgrade.log file for a full list of operations performed. If you are not upgrading to the OEM edition from OpenDJ 2.6, then this procedure does not apply. Skip instead to Procedure 2.2, "To Upgrade to OpenDJ 3". This procedure applies when you upgrade to the OEM edition from OpenDJ 2.6, changing the underlying backend storage. The configuration changes from a Local DB backend to a PDB Backend, but the upgrade command in this version deletes the data from OpenDJ directory server. Follow the instructions in this procedure to avoid data loss. Login as the user who owns the current OpenDJ server. Export all of the data to LDIF files. OpenDJ directory server OEM edition uses a new backend type, PDB. This edition does not support the older Local DB backend type. The upgrade process transforms the configuration to use the new backend type, but it does not export and import directory data. You must export the data, unpack the files of the new version over the old, run the upgrade, and then import the data. If you have not already backed up the current OpenDJ server, make a back up copy of the directory where OpenDJ is installed. When upgrading the .zip distribution, overwrite the current files. When upgrading native packaging, use the command-line package management tools provided by the system to remove the 2.6 package, and then install the new package. For details, see Procedure 3.3, "To Uninstall the Debian Package" or Procedure 3.4, "To Uninstall the RPM Package", and Procedure 1.6, "To Install From the Debian Package" or Procedure 1.7, "To Install From the RPM Package". Run the upgrade command to bring OpenDJ configuration and schema data up to date with the new binary and script files that replaced existing server files. Once this step is complete, OpenDJ directory server no longer has access to user data that was stored in Local DB backends. (Optional) If user data occupies significant disk space, and not enough disk space is available, then remove binary backups of the user data that you exported to LDIF. Import all of the data from LDIF files. Make sure you perform this step for all user data backends. Replication updates the upgraded server with changes that occurred during the upgrade process. The upgrade tool will reconfigure all JE backends as PDB backends. to LDIF so that it can be re-imported once the upgrade completes. Upgrade each server sequentially, as described above. Newer OpenDJ servers have updates to LDAP schema that enable support for some new features. The newer schemas are not all compatible with older servers. Enable replication using the dsreplication command delivered with the new server. Use the --noSchemaReplication or the --useSecondServerAsSchemaSource option to avoid copying the newer schema to the older server. It is acceptable to copy the older schema to the newer server, though it prevents use of new features that depend on newer schema. If some applications depend on Internet-Draft change numbers, see Procedure 8.17, "To Align Draft Change Numbers" in the Administration Guide. Replace the gateway web application with the newer version, as for a fresh installation. Procedure 3.1, "To Remove OpenDJ With the GUI Uninstaller"
Procedure 3.2, "To Uninstall OpenDJ From the Command-Line"
Procedure 3.3, "To Uninstall the Debian Package"
Procedure 3.4, "To Uninstall the RPM Package"
Run the uninstall command, described in uninstall(1) in the Reference. (Mac OS X) Double-click /path/to/opendj/Uninstall.app. The Uninstall Options screen appears. Select the components to remove in the Uninstall Options screen, and then click Uninstall to proceed. To complete the process, manually remove any remaining components indicated in the Finished screen. Login as the user who installed and runs the server. Run the /path/to/opendj/uninstall --cli command. Stopping Directory Server ..... Done. Deleting Files under the Installation Path ..... Done. See /var/....log for a detailed log of this operation. Removing the package does not remove your data or configuration. You must remove /opt/opendj manually to get rid of all files. When you uninstall the RPM package from the command-line, OpenDJ directory server is stopped if it is running. Copyright © 2011-2017 ForgeRock AS.